Now that the holiday season is upon us (or shortly will be), some of us will be thinking about buying an ereader as a gift. Consequently, I am reprinting a couple of articles that first appeared on Teleread‘s website and were written by a Teleread staffer. The articles are reprinted with permission from Teleread and are copyright 2010 by North American Publishing Company, the parent of Teleread. To reprint the articles, please contact Teleread. The second part of the “primer” will appear tomorrow. TeleRead E-Book Primer Part One: What is an e-book? Welcome to the first installment of my e-book guide for beginners. The purpose of this guide is to give someone who knows absolutely nothing about e-books the tools he needs to make an informed decision about what kind of e-book device, if any, to buy. This first section of the guide will start by explaining what e-books are, and will then cover their advantages and disadvantages over printed books so you have a better idea of why you might or might not want to buy them. In the simplest sense, an e-book (short for “electronic book”) is a computer file that contains words (and sometimes pictures) that can be read on a computer or other electronic device. If you’ve ever written a letter or a report on a word processor, then congratulations: you’ve created a very short e-book, at least by that definition. However, when most people talk about e-books, they’re talking about a specific kind of computer file, one that is specially designed to be opened by a specific computer or other electronic device. You’ve probably heard of some of them, or seen the advertisements on TV. The Kindle, web bookseller Amazon.com’s device, is arguably the most popular e-book reading device (“e-reader” for short), but people talk a lot about reading on Apple’s iPad tablet device, too. And of course there are plenty of others. But you don’t necessarily need a hand-held device to read e-books: many of them can be read right on your desktop or laptop computer, as well. Some people don’t find reading on a computer screen to be very comfortable, but on the other hand you’re probably reading this from a computer screen right now. The only difference between this and an e-book is that an e-book is a lot longer. Effectively, an e-book is a computer file containing the same words you would otherwise find in a printed, paper book, meant to be read by a specific e-book reading device or an e-book application (program) on a computer or tablet. However, this simple definition becomes more complicated because there are many different companies selling e-books, and most of the bigger ones want to be the only ones you buy e-books from. They try to do this by locking you in, making sure that the e-books you buy from them can’t be read on anybody else’s device or application. I will go into more detail about how they do this in the section on formats. For now, bear in mind that there are many different kinds of e-books, but most of them are similar enough to each other that I can talk about “e-books” in general and most of what I say will be true for all of them. Why (or Why Not) E-Books? Device Portability – Most modern e-book devices can hold literally hundreds or even thousands of e-books in their on-board memory—more e-books than you could read in a year, and certainly more than enough to keep you from getting bored on a long airplane ride or even a two-week vacation. And many of these devices are small enough to slip into a pants or jacket pocket so you can have them with you wherever you go. Instant Gratification – Have you ever heard about a book and wanted to read it right away, without having to leave your house to go to the bookstore or library? Do you live out in the country where it’s inconvenient to get to a bookstore? Or have you wanted a book in the middle of the night when the libraries and bookstores would all be closed? A nice thing about E-books is that you can buy and download them immediately from the comfort of your own home, at any time of the day or night. If you’re using a reader (such as the Kindle) that has an always-on Internet connection and built-in store, you can buy them at any place, too. One of Amazon’s slogans about the Kindle is that you can be reading any Amazon e-book within a minute of wanting it, though it’s just as true for a number of other e-book stores as well. Book Price – When a hardcover paper book and an e-book of it come out at the same time, the e-book version is usually priced lower. If you want an e-book of a paper book currently in $26 hardcover, you may be able to find it priced as low as $9.99. Furthermore, many e-books (such as the electronic versions of books that are now in the public domain) are available (legally) for free. Easy Reformatting – Just as you can make the text size bigger or smaller in a word processor document you’re writing, you can make it bigger or smaller in an e-book you’re reading as well. A considerable number of Kindle users are middle-aged or older people who like being able to turn any e-book into a “large print edition” that they can read more easily. Search Capability – If you want to find out where, or how many times, someone used a specific word in a book, or are wondering where a certain character first appeared, or want to find out any other fact, an e-book reader will let you find it much more quickly than riffling through the pages of a print book. Bookmarking/Annotation – You never need to worry about misplacing your bookmark, and don’t ever need to damage a book by folding the corner of its page to keep your place. Most e-book readers will let you bookmark pages just like you might bookmark a website in your web browser, and some will also let you add short text notes to yourself tagged to particular sections. Space-Saving – E-books take up no space on your shelf or in your house. They don’t contribute to clutter, and you can’t accidentally knock them off the shelf and trip over or step on them either. Backup Capability – Many e-book stores will keep a record of all the e-books you buy and let you download them again in the future, so if your e-reader is lost in a housefire you can still get all your e-books back. Not all e-book stores will let you do this, of course—Apple’s iBookstore is one major holdout—but even if you can’t re-download the e-books from the store, you can usually copy them to a CD or DVD-ROM or a backup hard drive you can keep somewhere safe just as easily as you can back up any other computer file. Compare this to a shelf full of print books, which you’ve lost forever if your house burns down. 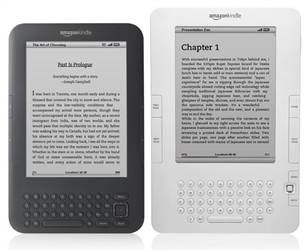 Requires Special Equipment – While you just need a paper book and available light to read a book, to read an e-book you need the book, the light (depending on whether the e-book reader has a backlit screen), and a device on which to read it. While e-ink readers are very efficient at conserving battery power, they do still need to recharge sooner or later; paper books never require batteries. Eye Strain – This is largely subjective: some people find they have problems reading from a small screen, or a backlit screen. Others find it suits them just fine. If you’ve never tried reading an e-book, you should try several of them out in a store, or borrowed from a friend, and see what you think before buying one. Format Lock-In – If you buy an e-book from one of the big e-book companies, it will come in a format that you can only read in that e-book company’s devices and applications. If you buy a Kindle e-book, you can read it on a Kindle device, or Kindle Reader applications for your computer or tablet, but you can’t read it on a Barnes & Noble Nook. I’ll explain this in more detail in the section on formats—it’s one of the biggest problems e-books have, and one of the greatest sources of confusion to new e-book users. Device Expense – E-reader prices have been steadily declining over the last few years, but they still cost a pretty penny. The least expensive Kindle is about $139, though it will probably fall to $99 or below sooner or later. That’s still a lot to spend on a device you might accidentally leave on the bus or drop in the tub. E-Books Can’t Be Resold – With traditional books, the used book store provided a way to recoup some of your investment in books you no longer need. You can buy them, read them, then pass them on when you’re done with them. You can’t resell e-books, however, because there’s no physical artifact associated with them: if you pass them on to someone else, it still leaves a copy of them with you. Region Restrictions – One of the fundamental differences between printed books and e-books is that their sales are treated differently. While you can order a printed book from overseas because the point of sale is legally considered to be the country of origin (you bought it there, they’re just shipping it to you), when you buy an e-book the point of sale is considered to be your own computer. Effectively this means an American who could order a British paper book from amazon.co.uk can’t buy a British e-book of the exact same title. E-Book Formats May Change – While e-book files can easily be backed up, there is no way to be completely sure that the e-book store you buy heavily into today will necessarily be around tomorrow. If a given e-book store should go bankrupt, or be bought out by someone who closes it down, people who bought that store’s e-books could find themselves in the same position as a heavy adopter of Betamax after VHS won the videotape format wars back in the early 1980s: his device and the media for that device still work just fine, but there won’t be any more media coming out for that device and after the device breaks he can’t get another. (I’ll talk more about this when I cover formats in the next section.) While this isn’t likely to happen to any of the major players at this point, it’s always possible. Doesn’t Smell Like a Book – Some book-lovers simply prefer the look, feel, weight, and yes, smell—of a paper book, to the point where the lack of these aesthetic factors is one of their main objections to the format. E-book lovers often accuse them of losing sight of the fact that the main purpose of a book is not to look, feel, and smell a particular way, but to have words in it that you read. In this section, I’ve explained that e-books are computer files containing the words that would otherwise be printed on paper to make up a printed book, and have gone over some of their major advantages and disadvantages. The advantages include such things as the ability to carry hundreds of books in your pocket, or to buy books at any time and place. Disadvantages include the requirement of an expensive hardware device to read them and the inability to resell them. In the next section, I will list some of the major e-book reading devices and applications, and talk about the different e-book formats that are available.